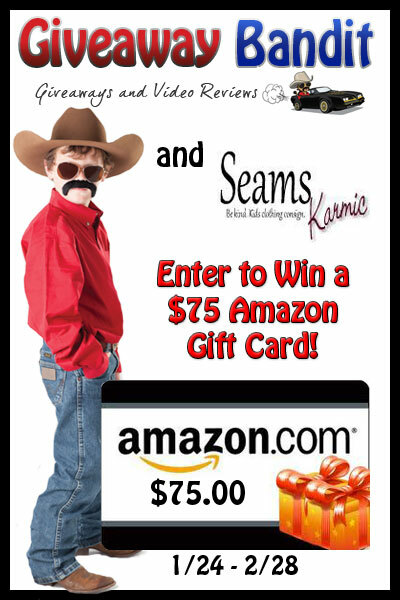 Giveaway Bandit has teamed up with Seams Karmic to bring you a giveaway for a $75 Amazon Gift Card! Seams Karmic is an awesome new site that allows us busy moms to shop for high quality kids’ clothes online! I’m sure you have boxes of your kids’ clothing they have outgrown. They even let you sell kids’ clothing at Seams Karmic! I always try to keep a few my sons’ favorite outfits, but being able to get rid of a lot of them while making money is perfect especially while I’m sitting at home in my pajamas! Seams Karmic – Be Kind. Kids Clothing Consign. Seams Karmic is the simplest way for busy moms to shop and sell high quality, practically new kids’ clothes online. Shop your favorite kids brands at up to 80% off retail. Quality is guaranteed and they will accept refunds should you not love the clothes you bought. Busy moms can also sell outgrown kid’s clothes without leaving home by ordering their Closet Cleanse bag service to easily earn cash for your clothes. Seams Karmic offers an added bonus for those moms selling kids’ clothes; should there be an item they cannot buy from you, they offer to donate the item on your behalf, and return to you the donation receipt (and good karma)! Free shipping on orders over $40 and flat rate shipping of $5.95 for all other orders. Seams Karmic is giving away a $75 Amazon Gift Card to one lucky winner! Giveaway is open to the US only, ages 18 and older and ends February 28, 2013 at 11:59 pm EST. Enter via the Rafflecopter entry form below. Be sure to head over to Seams Karmic and let us know what products you love! Good luck everyone! I love this dress: http://www.seamskarmic.com/Osh_Kosh_24M_Dress_p/83-120.htm I only wish they had it in my daughter’s size! The Youngland 3T dress is adorable and would fit her perfectly. Love the OshKosh layered onesie. WOW! I love consignment shopping….I just wished they had more older boys clothes…there was only one item at at GREAT PRICE thO!!!!!!!! I LOVE the Carter’s Size 9M 2 Pc. Dress! Carter’s is such a GREAT brand of kids clothing! I love the girls daisy coat & the pants with the tutu…just darned cute clothes for children!!!! I like the Old Navy 2 pc grey stripe set! http://www.seamskarmic.com/Old_Navy_Girls_2T_Sweatshirt_Set_p/84-109.htm this is such a great idea, my gf was selling her boy’s stuff on instagram but this seems so much easier. I’ll pass along the word!! I love the Gap Baby Sweater & Skirt Set. The Bonnie Bandit will work. wow ! thier prices are great,id recommend to everyone.if you want to save on kids clothing,check them out. We’re happy you liked the site! Good luck on the giveaway. I LOVE this website! I had no idea it existed! So happy to have found it and will be a new loyal customer! YAY! We’re thrilled you’re excited about the site! Thanks for checking us out and good luck on the giveaway. I like the animal print Bonnie Baby coat – so cute! I like the Cherokee Jeans 12mo for my darling nephew! I like the Children’s Place Sleeve Shirt size 7/8. I like the Okie Dokie 2T Track Pants @ http://www.seamskarmic.com/Okie_Dokie_Boys_2T_Track_Pants_p/94-103.htm. The Curious George 12M sweatshirt is cute! I love the Gymboree Boys 128-24M Rhino Shirt. It is so cute! We’re so happy your thrilled about the site. Thanks for your kind words and we look forward to being one of your top choices for your kids clothes. Good luck on the giveaway. They have a super-cute pair of Baby Gap searsucker pants that would be so so perfect for my new nephew! To much to choose just one thing-but what I like is that your prices are great/affordable, free shipping over $40 and your quality of the clothing is guaranteed. Thanks for sharing. Hey Shannon! Thanks for the kind words and good luck on the giveaway. I like the Osh Kosh Shirt! I jus think that the Carters 24M Boys sleep pjs are so cute! I can not believe the incredible prices on these clothes. My sister has a 6 month old boy and must tell her about these prices! I like the Okie Dokie 18M. I love the gap baby leggings. I like this Size 12M Long Sleeve Onesie w/Pants. This is very cute and I could make it work with a lot of outfits! I like http://www.seamskarmic.com/Carter_s_Fleece_Sleeper_24M_p/93-133.htm. Excellent prices. I love the Size 6-12 Months Adidas Track Jacket. There’s a great little girl’s leopard coat I love! Wish it would fit me! Love the boys button down shirts! I like the Dress 3T by Blueberi Boulevard! It’s not 11:59pm EST yet.